Huntington Creek begins at Electric Lake. Just below the reservoir is a very challenging section because the water is crystal clear. The fly-fisherman needs to make perfect casts in this section to be able to catch any fish. As with any clear mountain stream you will need to be very stealth with your approach, you will need to cast very carefully and use a thin leader or tippet. As the water leaves this flat stretch it will pick up speed and turn in to a typical trout stream. There are plenty of pools and riffles along the stream. The river is surrounded with various trees, which helps the fish because of larger insect varieties and counts. Some of the best fishing on the river is from the bridge just below Electric Lake and through the winding canyons to where it meets Left Hand Fork. There are plenty of insects to feed on and there are all types of water that trout look for. The fish will be exactly where you would expect to find them on this creek. The Huntington is located in an area that is remote enough to give you some solitude, but great enough to keep bringing you back for more. There is not a lot of pressure on this river and you should be able to find a stretch of water to test your skills. 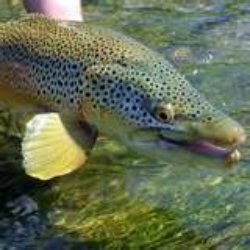 There are wild Brown trout and Cutthroat, along with stocked Rainbow that give you a nice taste of fly-fishing. If you are from Utah you will understand the beauty of this nice river. If you have never been to Utah you should come take a look at this river, or the Green River. They both offer up some great fishing as well as some great outdoors experience. Here is a link to a Google map of this river area. Leave the Huntington Creek page and return to Utah page.